The recent finds have revealed that Persian tribes took up residence in Bojnourd at least 4,200 years ago. 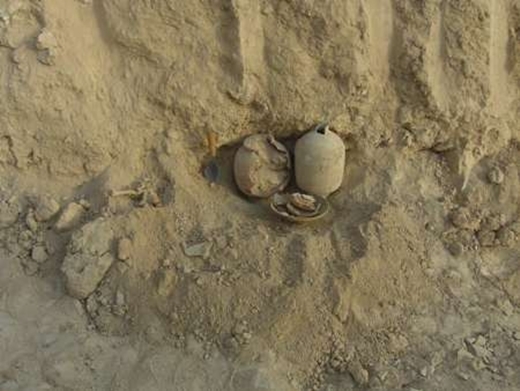 Deputy Director of the Cultural Heritage, Handicrafts and Tourism Organization Ali Akbar Vahdati said that a Zoroastrian grave as old as 4,200 years has been discovered at the northeastern heights of Bojnourd in North Khorasan Province. He further said that a bone sample from the skeleton was sent to a laboratory for DNA tests and studies on the vessels and the grave revealed signs of the Iranian civilization and Zoroastrianism in the region. The ash found in the grave and the skeleton of a dog in an adjacent burial plot are indicative of Zoroastrian burial rites.